Just about in the geographical centre of Britain near to the small town of Haltwhistle in Northumberland can be found the picturesque Featherstone Castle. The oldest part of the existing castle dates back to the 1400s and that is a tower which was built by Thomas de Featherstonehaugh in around the second or third decade of the 14th century. The Featherstonehaugh family were still the owners of the castle until the 18th century and recent additions to the castle were made during the 19th century. 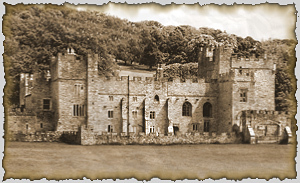 One well-known ghost story which is attributed to this fine old Castle concerns Abigail Featherstonehaugh who lived in the late 17th century. The story goes that she was in love with a boy from the local Ridley family but that she was due to marry the son of a neighbouring Baron in a sort of arranged marriage which was probably at the behest of her father Baron Featherstonehaugh. Apparently as was the tradition, the wedding party, all with the exception of Baron Featherstonehaugh who would oversee the banqueting arrangements, left for a hunt following the wedding. Legend has it that as the bridal party was riding through the estate there was an ambush possibly set by the spurned lover from the Ridley family. Although the new bridegroom fought gallantly, all the wedding party were killed in the affray. As midnight passed, the Baron, sitting alone, heard the sound of horses hooves arriving outside the castle and it is said that the door opened following which the ghosts of Abigail and the rest of the wedding party entered making no sound and passing straight through solid objects. It is said that the ghostly wedding party is seen again each year on the 17th of January on the anniversary of the tragedy.